*Lineup: Justin & Ryan from Blue October *Description: You loved them at City of Trees, so we're bringing them back for an intimate acoustic performance at the Historic Crest Theatre! 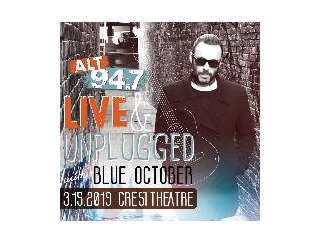 Join us on Friday, March 15th for Blue October Live and Unplugged! Special acoustic performance, live Q&A, plus photo ops with Justin and Ryan! Tickets available at alt947.com Visit blueoctober.com to become a VIP and get the full intimate experience! Doors open at 7pm.